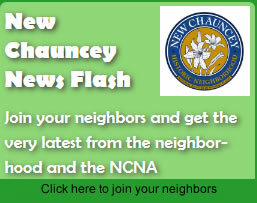 The New Chauncey Neighborhood Association’s Leadership Team works to keep the community connected with timely newsletters and fun events for the whole family. The links above will help guide you to some of the rich resources that are provided by the NCNA, the City, along with some recommended service providers. As part of our effort to build community between the City, residents and property owners, we encourage you to step up and step out to get to know your neighbors and the property owners on your block. Most misunderstandings can be eliminated with a little R-E-S-P-E-C-T (with apologies to Aretha ) and good communication. Everybody wants to have a safe and friendly community where neighbors know one another and are there to lend a helping hand – it’s your turn to step up and do your part. The New Chauncey Neighborhood has a group of volunteers we call “Our New Chauncey Neighborhood Street Reps.” These residents help spread the word on upcoming events, can help you find the answers to you neighborhood questions, and help tie the neighborhood together. Please drop them a note and thank them for helping out. Or even better, offer to help them on your block! Additionally, the New Chauncey Neighborhood has its own political action committee aptly named CHAUNC-PAC. You can become more involved in the City’s political workings and advocate for our neighborhood at the same time. See the CHAUNC-PAC web site for more details.